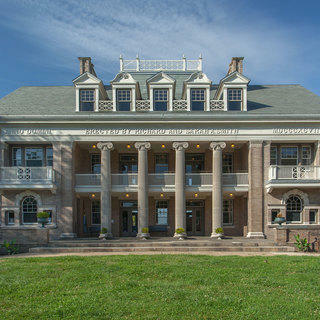 Imagine a historic mansion with more than six acres of open fields -- all for children. The Smith Memorial Playground & Playhouse was established in 1899 by Richard and Sarah Smith, at a time when families, social workers, and child psychologists started to advocate for places to have safe, supervised play for children. The Smiths sere very successful in the printing industry, but they had no one to inherit their wealth. They decided to serve the community by establishing the Richard and Sarah Smith Trust to create the playhouse. The interest from that trust provided sufficient funds to support over 100 years of operation. However, by the early 2000s the trust became insufficient to keep the playhouse open. Since there were also issues with safety and accessibility for the deteriorating property, the bankers in charge of the trust decided that Smith should be closed. Several concerned citizens didn’t want that to happen, so they formed Smith Memorial Playground & Playhouse Inc., a non-profit organization made up of concerned citizens with a goal to raise enough money to restore and maintain Smith. Their efforts were successful, allowing the property to operate separately from the trust fund. Now Smith is not only restored but improved. Much of the property’s open field now has modern playground equipment that is both safe and accessible. One of the most popular pieces of the playground, and certainly the most historic, is the Ann Newman Giant Wooden Slide, built in 1905. At 12 feet wide and nearly 40 feet long, a dozen children could ride side by side. Inside the mansion is one playroom after another. 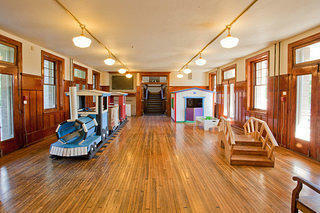 Kids can play with blocks, doll houses, puppets, trains, and more. There has been a lot of change for playgrounds and playhouses over the past 100 years. Safety regulations often require such places to be replaced and updated. But with the historic mansion and wooden slide adjacent to new colorful playground equipment, the Smith Memorial Playground & Playhouse combines the best modern practices with the best of history. On this property, both the past and the future are well preserved. 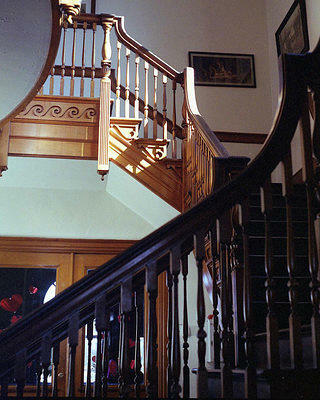 A staircase inside the Smith Playhouse. Inside one of the playrooms at Smith.